Surprise surprise, The Body are back and as cheerless and dire as ever. You thought I Shall Die Here was the nadir of their nihilistic loathing? Their new album, out on Thrill Jockey next month, is called No One Deserves Happiness. 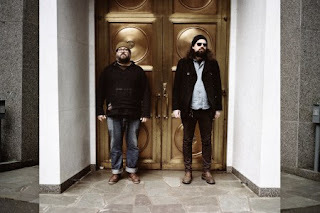 And judging their work alongside Thou and Wrekmeister Harmonies, it’s more than likely that the duo will push the black envelope further out into the void (they are quoted as saying they want this record to be the grossest pop album of all time). ‘Shelter Is Illusory’ shows off their new tangent in all its misery-inducing glory – the synthetic handclaps, the soaring production, the calibrated, pummelling drums. It feels windswept, a dark chasm with smoke machines and a toga-flailing Syren calling forlornly across eternity. Finding new ways to hate and self-flagellate. The Body are hitting Europe in April, see below for details (London’s show is at Electric Brixton on the 13th - with Converge no less! Get tix here).